Urban population of India is growing at the rate of 31.8% during the last decade to 377 million (Census 2011), but it does not have enough resources or adequate systems in place to treat its solid wastes. Urban areas in India generates 1,00,000 MT of solid waste per day (CPHEEO,2000). Collecting, transporting, processing, and disposing of this municipal solid waste in a scientific manner is the responsibility of Urban Local Bodies (ULBs) in India. The Municipal Solid Waste (Management and Handling) Rules notified in 2000 and later on revised in 2016 by the Ministry of Environment and Forests require ULBs to collect waste in segregated manner with categories including organic waste (food waste, vegetable market and garden wastes); recyclables wastes (plastic wastes, paper and cardboards, glass and metal, etc.) and domestic hazardous wastes (batteries, tube lights, sanitary napkins and medicines, etc.) and undertake safe and scientific transportation management, processing and disposal of solid wastes. However, most ULBs find difficult to comply these rules due to inadequate resources, lack of management systems in place, inadequate professional personnel and lack of citizens’ participation. Improper solid waste management deteriorates public health, causes environmental pollution, accelerates natural resource degradation, causes climate change and greatly impacts quality of life of citizens. On the other hand, waste pickers and informal recyclers play an important role to provide sanitation services across the urban India. Most often their role in formal solid waste management systems is neglected and not recognized legally; on the contrary they have been regarded as public nuisance for society. Mostly they pick recyclable materials from trash heaps and depend upon revenues derived from sale of recyclables for all or part of their livelihoods. 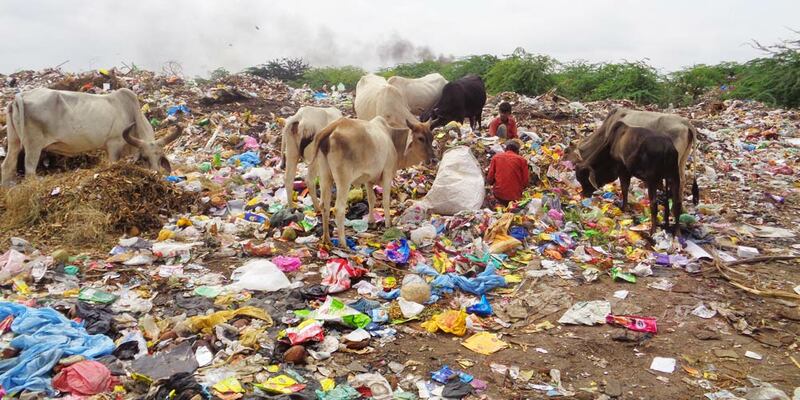 Due to lack of recognition, policy and regulation to protect their rights, waste pickers in India are facing multitude of problems including lack of social protection, poor sanitary condition and occupational health issues. The National and State Governments have provided an impetus to improve the solid waste management in urban areas under various schemes, programmes and policies. Jawaharlal Nehru National Urban Renewal Mission (JnNURM) till 2014, Swachh Bharat Mission, a remarkable flagship programme of Government of India launched in October 2014 aims to make India cleanest nation by 2019 and Mahatma Gandhi Swachhta Mission of Government of Gujarat launched in February 2014 to make cities clean as tribute to Mahatma Gandhi on his 150th Birth Anniversary provides grant support to ULBs through State Governments for city level planning; awareness campaign and IEC material to increase community participation; equipment and infrastructure support for transportation, processing and disposal to improve service delivery through encouraging Public Private Partnerships for technology solutions and public investments in SWM. This programme also aims formalizing role of waste pickers and informal sectors in SWM and last but not least, support for improving financial sustainability through encouraging levy of revised SWM service charges to meet operation and maintenance costs of service delivery. Several cities in India for example Bengaluru of Karnataka, Pune and Mumbai from Maharashtra, Panaji from Goa, Warangal from Andhra Pradesh, Ahmedabad, Surat, and Rajkot from Gujarat have taken positive steps towards implementing sustainable waste management practices by involving the community in segregation by enforcing better PPP contracts for bringing private investments, by investing in modern technologies for transportation, processing and disposal of SWM and by enforcing improved service charges to enhance financial sustainability of SWM operations. The role of waste pickers and informal recyclers is also being increasingly recognized in the formal waste management operations. Bhuj, a Class A city having population of 1.48 Lakh (Census 2011), spread in 56 sq.km. area and administratively divided into 11 wards. The city daily generates approximately 60Metric Ton waste. Sahjeevan, a civil society organisation, assisting Bhuj Municipality to implement Municipal Solid Waste Management Rules in the city and helped develop city level SWMDPR so that municipality can implement phase wise plan as proposed under DPR.As far as waste composition is concerned, 60% would be organic waste (Kitchen waste, vegetable market waste, garden waste) 30% would be recyclables (plastic wastes, paper, card boards and glass wastes) while 10% would be non-recyclables. The DPR proposes to have zone wise (comprising of 2-3 wards) Waste Recycling Centre to process the wastes so that only reject or non-recyclables would go to landfill. Solid waste management is an important basic urban service, by and large, performed by Urban Local Bodies. The waste in Indian cities has increased drastically in the last decade. Despite various technologies available to recycle and treat waste, the municipalities are unable to satisfactorily fulfill their duties. Cities are huge guzzlers of natural resources and at the same time, are extremely inefficient in using it effectively, hence, creating huge wastes. The municipal waste of a city generally contains 25-30% as construction or demolition waste.